Otoplasty is a common surgical procedure performed to “pin back” or correct protruding ears. The surgery can be performed on adults as well as on children over five years of age. It is often recommended at an early age to help alleviate teasing at school by other children. Many parents are often unaware of or underestimate the severe psychological trauma that can result from such harassment. There are many technique for otoplasty. The most common (traditional) method involves incisions in the back of the ears to expose the ear cartilage. Some cartilage is usually remodeled or reduced before the ear is repositioned. Sutures are then used to maintain this correction. The exterior skin is sutured and the ears are bandaged for several days to protect them in their new position. Sutures are generally removed within a few days. Dr. Chugay’s technique is centered around re-creating a normal cartilage fold in the ear. To create a normal fold, parallel cuts are made in the cartilage in the region where the normal fold is expected, and several permanent sutures are placed to maintain that fold. Then, the ear is pinned back with permanent sutures going from the edge of the ear to the lining of the bone to permanently flatten out the ear in the more natural position. The standard technique often produces artificial-looking sharp edges because it requires reduction of a strip of cartilage. Such methodology is unnecessary except in a very limited number of cases because the appearance of large ears is not caused by the actual ear size but by the angle of their position relative to the patient’s head. Dr. Chugay’s otoplasty includes a technique of creating a natural-looking ear fold. The cartilage of the protruding ear is incised in two places and sutured together with sutures. No cartilage is removed. This method yields the natural-looking ear fold with smooth edges. How Common is the Technique that Dr. Chugay Uses? The technique utilized by Dr. Chugay is not uncommon, and it has been independently popularized by many plastic and cosmetic surgeons. Nonetheless, most surgeons still continue utilizing the standard procedure. 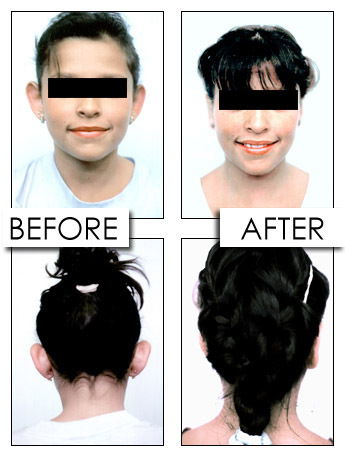 To ensure that you or your child end up with natural-looking ears, make sure that your surgeon does not use the standard technique. The improvement from surgery is readily apparent, although the final result will not be evident for several weeks due to swelling and other natural changes that are a result of healing. Swelling and bruising are normal, but usually disappear within a week or so. Patients usually return to full activity by the end of two weeks, although it is necessary to protect the ears from trauma or bending until healing is more complete. Discomfort is mild and rarely is pain medication required.